Last year, the first time I posted a Year in Review post, I was wrapping up a year where I didn’t post nearly as much as I would’ve liked to. This year has been a complete reversal of that trend. Though I haven’t succeeded in posting every single week, since starting the series in February I’ve made 32 posts in the series (and might squeeze in one or two more before the year is truly over). I missed the first five weeks of the year, and about six weeks total following the two traffic accidents to which Kate fell victim this year. I have posted in 32 of the 45 weeks since starting the series, though — 71 percent of the time. It’s a C-, but it’s still technically passing. In 2014, I posted 14 stories — barely enough to make it worth focusing on the most popular posts published that year — so I looked at the most popular posts overall that year. This year I’d like to do both. Unsurprising, really — I know my site ranks very highly with Google for search terms related to some of those older camera reviews, in particular the two about the Nikon FM2n. I’m thrilled that a couple of this year’s posts have worked their way into this list, already, though. Thanks to them, and the increased frequency with which I’m posting, I’ve nearly doubled my site traffic, year-over-year, in 2015. That the top post was published so late in the year is thrilling to me, and that a post I published in January — the first of the year, in fact — managed to stay up there as it’s rapidly become one of the top results on Google for its topic is reassuring that I’m not doing all this unpaid work for nothing. 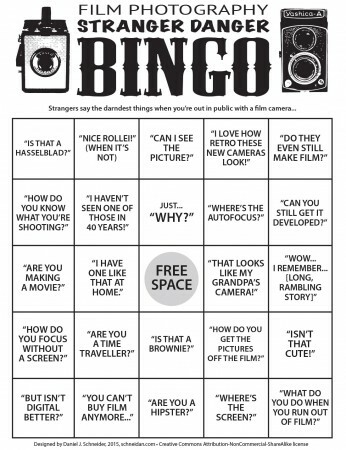 Film Photography Stranger Danger Bingo! Developing: Where to get film processed in Denver took some work to compile, but shot to nearly the top of Google for searches about that subject, and almost every day I get a couple visitors looking for film processing in Denver — which makes it all worth it, as I hope I’ve helped a few people out and steered some business to our local labs, which can surely use it (the more people help them stay in business, the longer I can benefit from them without solely supporting them!). Two more posts, 18 annual film photography events you can join and Game time: Play Film Photography “Stranger Danger” Bingo! were published mostly for fun — a whole new area for me. Compiling my events post actually took several long nights of work, lots of communication with the #believeinfilm community on Twitter, and a considerable number of emails. I’m glad it went somewhat viral, though, and even spurred one event to kick off early. The bingo game resulted from a little idea I had and kicked around with the same communities one Saturday morning while I was in the newsroom. I spent my lunch break throwing the game board and post together, and by the time I left for the day it was already spreading to film photographers around the world. It wasn’t a lot of work, but it was a lot of fun, and the feeling that I’m providing some fun for the film community at large is very gratifying.